Growing up, my mom would always sing-song the ever-frustrating “don’t cry over spilled milk.” I get it. Don’t freak over a little mess (physically or figuratively). 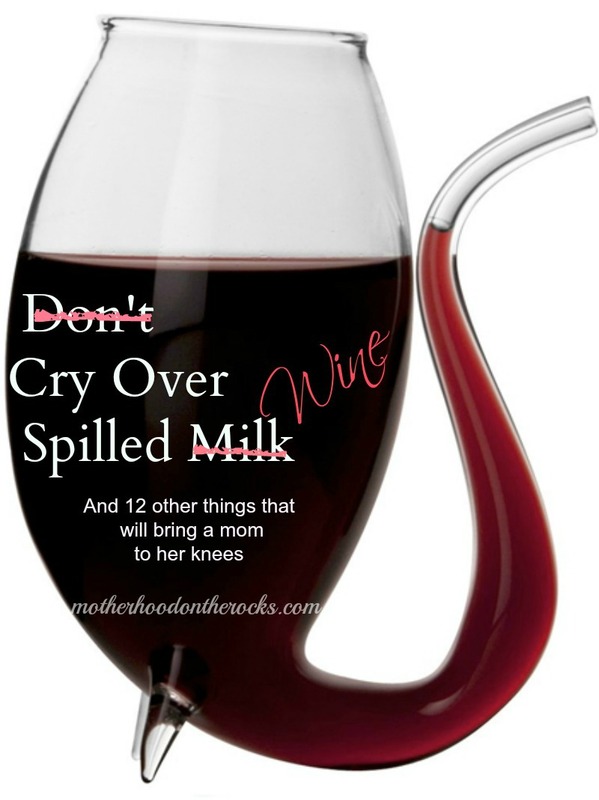 But wine…I will have a massive tantrum over spilled wine. Believe it or not, there are a few things that are almost as frustrating as spilling liquid gold! Read on for 12 more that can bring a mom to her knees! Milk – Whoever said don’t cry over spilled milk probably doesn’t have children. Also, if you don’t understand how milk ends up on the ceiling, you’ve probably never spent an afternoon with toddler. Laundry Detergent – Ummm..”someone I know” dropped a brand new (read: full) bottle of laundry detergent once. The bottom cracked and it flooded the laundry room. The floor still feels slimy … or so I hear. Lotion – Like laundry detergent, you need some serious degreaser to get this out of carpet. Perfume – Unless you want your house smelling like a brothel, be really careful! Cheerios – You will never, ever find them all. And until you’ve done it, you can’t understand the disgust you feel when you crush a Cheerio to dust with your foot. Bucket of Legos – Have you experienced the excruciating pain from stepping on a Lego in the middle of the night? Keep a tight lid on the bucket and for the LOVE of your toes, clean them up immediately after your child scatters them all over the floor. Or better yet, toss ’em. They can stack stuffed animals instead, right? Pumped Breast Milk – Although I loved (insert eye roll here) the countless hours spent hooked up to a breast pump like a cow, spilling even one ounce of breast milk is heart-wrenching. Nail Polish – Like juice, nail polish is evil and should be in a safe with a combination lock around toddlers. Juice – It doesn’t matter how soon you try to clean it up, juice will have you on your knees scrubbing the carpet until your knuckles bleed. Then you have to clean up the blood. p.s. If you want one of these cool port wine sipper, you can get them on Amazon , however, I don’t think they hold much. Also, whoever said, “Don’t try over spilled milk,” has never pumped. Love this post! Love the term “mom floors”. I can totally relate! Whoever said don’t cry over spilled milk never had to clean 5 million little milk dribbles from a 2 yr old! Seriously great list! Any mom understands for sure! oh you nailed it! every one of those! I would totally be in tears over! Some things are worth a few tears and a moment of frustrated crying. Great list! Luckily my son loves “clean up” 🙂 And yes, I would get pretty sad if I ever spilled my wine. Spilling cookies, candy or cupcakes really make me weep. And breast milk (when i had some) was like liquid gold. I would add an entire shipper of flavored olive oils at the grocery store. I didn’t knock it over, but I had to clean it up when I worked there! What a MESS! This is so funny!! I also hate it when I spill my wine!!! I love you. This was brilliant. I literally stared at my almost full gallon milk yesterday that almost got knocked over in my mad dash to refill sippy cups, and thought how much I would cry if I did spill it. A trip to the grocery store with the kids in tow to replace it? Easily worth 16x the cost! I love this post! I cry whenever my kids try to be “helpful” and refill the giant bin of sugar. It’s inevitable that they’re going to spill most of the bag all over the tile floor, and even after they try to be further helpful by sweeping and mopping, I’m still going to feel the grains of sugar, and sticky spots. Haha! This is SO true! I’ve cried a time or two over spilled liquid. hahahahahahaha “I would abide by the 5 second rule, but I have mom floors.” LOL Oh, so true over here, too! Gatorade: the large bottle – full – fruit punch flavor. 3 years later and the cheap linoleum is still pink. I am trying to remember if there is anything that has not been covered here that I have spilled. I know I have probably spilled every food possible, most beverages – but not alcohol. That is against the rules of the family I married into, and then divorced out of, but am still a part of through love and relationship. You do NOT spill alcohol. It’s sacrilegious. Oh, the nail polish! When my (now 11) daughter was 2 we were babysitting a friend’s 2 year old. The girls got up in the middle of the night and used all my nail polish to “paint” the bathroom counter, cupboards, walls, and floor!